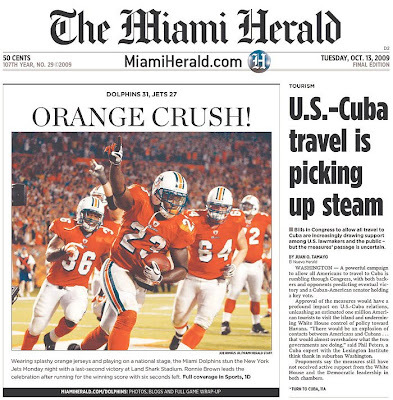 What's up with all the "Orange Crush" headlines at the Miami Herald? Bill at Random Pixels did some research and found a bunch of "Orange Crush" headlines at the Miami Herald dating back to 1982. Click here to see a sample. Below is the Herald's front page from yesterday. then there's the other headline -- picking up steam? Cliche. They do need help. Clever heds are treasured at McClatchy and other papers. They win awards. The ship might be going down, but, dang, we got us some great headlines! Ahhh. Investigative reporting at it's best. Slow news day MW? The best you got today is trash talking a headline? "But it's so cute and still sounds fresh. Like the "three-peat" phrase and those other nifty little saying we use in the sports world".